Family and Friends Event – Everyone Welcome! 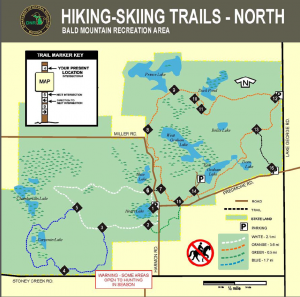 Bald Mountain Recreation Area has a number of family-friendly trails. We’ll be hiking about 2.1 miles on the White Loop, with the option of hiking further on the Blue Loop. Come enjoy a Fall walk in the woods. Trails are jogging-stroller friendly, and leashed pets are welcome! Don’t forget your camera, we’ll be walking around several scenic undeveloped lakes. We will be meeting at the White Loop parking area at Predmore Rd and Harmon Rd. We’re meeting at 12:45 SHARP(ish). Please be sure to bring water and snacks for the hike and wear comfortable, sturdy shoes. The group will leave the parking lot more-or-less together at 1pm and walk clockwise to the left from the parking lot. Please plan to stop at the midway point – marker #6, at the bench – for a group picture and apples. Parked vehicles should have the new Michigan Recreation Pass. Passes are available at the Secretary of State when your plates are renewed.